Once more time Future Oceans gets out of the Lab to disseminate scientific knowledge about climate change adaptation. 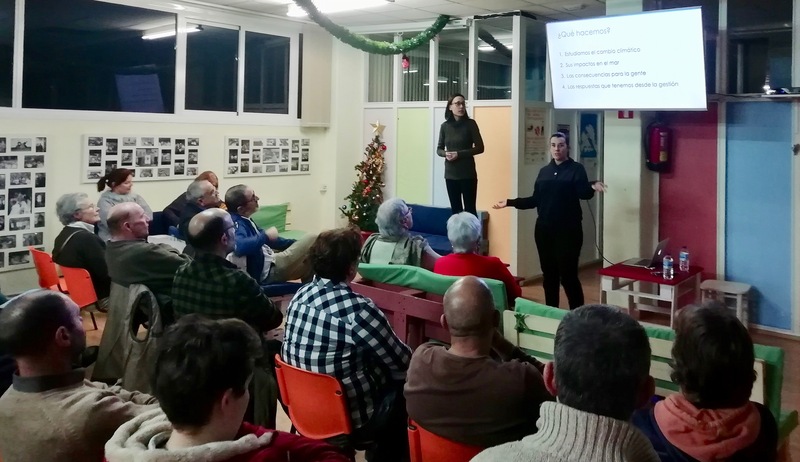 In this occasion, Elena Ojea and Diego Salgueiro reached the Asociación de personas sordas-AsOrVigo (Assotiation of deaf people) in Vigo to talk about their current research in climate change impacts on marine environment and small scale fisheries adaptation. The whole activity was translated by a professional interpreter. After the personal presentation, the talk illustrated the transversal perspective that Future Oceans Lab drives through its research lines. Also key concepts as socio-ecological systems, climate change consequences, adaptive capacity, adaptation actions and socio-ecological networks were discussed and highly followed by a diverse and interested audience with many questions in mind. So the exciting talk was characterized by interactive questions and spontaneous interventions of very motivated participants. This event, is other example of how Future Oceans attempts to apply resilience principles day-to-day by maintaining diversity, foster complex adaptive system thinking, encourage learning, broaden participation to enhance collective processes and collective actions so needed today for a well-being and environmental health. Thanks to the Asociación de personas sordas de Vigo for its very nice acceptance, participation and sensitive audience. Very glad of the results and with hope of coming soon, and next time signing Spanish language thanks to the dictionary of sign language, a special gift from the visit!